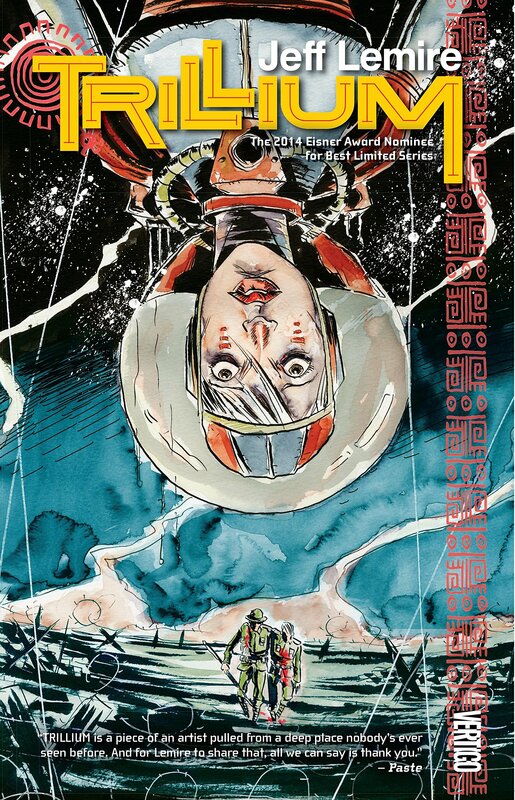 The Science Fiction Book Club is looking forward to our last venture into time (for the semester) with Jeff Lemire’s Trillium. It’s a cross between Romeo & Juliet, Indiana Jones, and Cloud Atlas with a heavy dose of sci-fi masterfully illustrated in ink and watercolor. 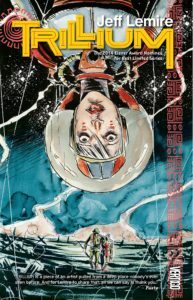 Trillium was originally published as comic book miniseries. This collects all eight issues into one trade publication. Lemire is a prolific comic creator, having written and illustrated many titles of his own and contributed to works published by DC and Marvel. Lemire’s perhaps best known for Essex County, a graphic novel about a fictionalized version of his hometown in Canada. With it he earned a nomination for a Harvey Award in 2008 for Best New Talent. The first volume won the Alex Award from the American Library Association. Trillium was nominated for an Eisner (the Oscars of comics) for Best Limited Series. You can find Trillium at your local public library or through interlibrary loan. We look forward to chatting with you about Trillium on Tuesday, December 4th at 2pm in Library 314. This entry was posted in General Library on November 6, 2018 by Shristi Bhat.